1. Find the remainder when 54679768 is divided by 11. Sum of the digits at odd places = 5 + 6 + 9 + 6 = 26 Sum of digits at even places = 4 + 7 + 7 + 8 = 26 Difference between the two values = 26 – 26 = 0 So, the given number is completely divisible by 11. 2. A watchman goes 15 km towards east and then turns towards south and goes 20 km. He then turns left and goes 15 km. How far is the watchman from his starting point? 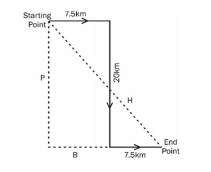 H = √625 H = 25 Thus, the distance between starting point and end point is 25 km. 4. The sum of three consecutive numbers is 1383. What is the largest number? The adjacent angle are (2x) and (7x) as shown below. So, the angles are 40, 140, 40 and 140. 6. 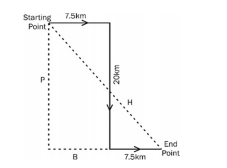 Which of the following are supplementary angles with ratio 4: 5? Sum of supplementary angles is 180. Therefore, (4x) + (5x) = 180 (x) = 20 So, the angles are 80 and 100. 7. Find the value of √5067001. 8. After selling 70% oranges, a fruit seller had 360 oranges left. Originally, how many oranges did he have? Let the original number of oranges be x. 9. The difference between 31% of a number and 13% of the same number is 576. What is 17% of that number? 10. A sphere and a right circular cylinder have equal volume and radii. What is the ratio of the height of the cylinder to the radius? Find the remainder when 54679768 is divided by 11. A watchman goes 15 km towards east and then turns towards south and goes 20 km. He then turns left and goes 15 km. How far is the watchman from his starting point? The sum of three consecutive numbers is 1383. What is the largest number? Which of the following are supplementary angles with ratio 4: 5? Find the value of √5067001. After selling 70% oranges, a fruit seller had 360 oranges left. Originally, how many oranges did he have? The difference between 31% of a number and 13% of the same number is 576. What is 17% of that number? A sphere and a right circular cylinder have equal volume and radii. What is the ratio of the height of the cylinder to the radius?